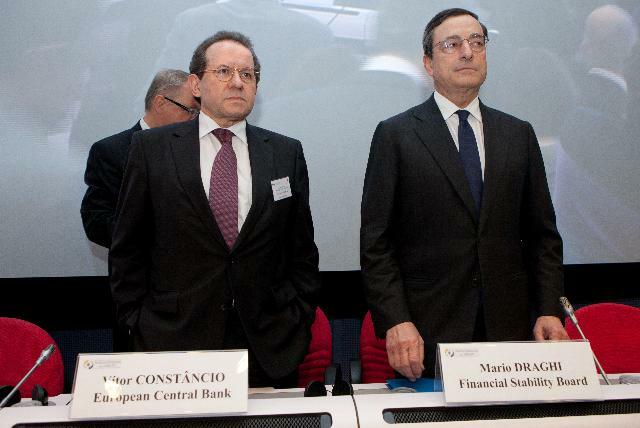 Vítor Constâncio, Vice-President of the European Central Bank, on the left, and Mario Draghi, Governor of ECB. (EC Audiovisual Services). The European Union authorities have so far bestowed hundreds of billions of EU taxpayers’ money to the European Stability Mechanism and the European Financial Stability Facility of a total value of at least €700 billion, to be used to bailout banks and not only. As if those practically unlimited resources were not enough to secure a smooth operation of the banking industry, Vítor Constâncio, Vice-President of the European Central Bank asked for more. Speaking yesterday on the establishment of the Single Supervisory Mechanism (SSM), he said this is not enough and more money is needed to make sure that banks can have it their own way. As a matter of fact Constâncio asked that another bailout mechanism is enacted to offer additional coverage initially to the “systemic” European banks. This mechanism is called Single Resolution Mechanism (SRM) and will be operational within the under-construction SSM. We are about to lose count of how many mechanisms and how much money the banking industry is asking for, to cover potential bankruptcies possibly resulting from careless spinning of other people’s money. In plain English the vice president of the ECB asked for more public money in favour of banks. Let’s follow him: “A second element of the Banking Union is the establishment of a Single Resolution Mechanism. The framework for the Single Resolution Mechanism is still to be defined and I look forward to the Commission’s upcoming legislative proposal. Let me nevertheless highlight the main features that in my view such a Mechanism should have. The Single Resolution Mechanism would have a Single Resolution Authority at its centre that would govern the resolution namely of significant banks, coordinate the application of resolution tools and reflect an organisational set-up similar to the SSM. It should have a comprehensive set of enforceable tools, powers and authority to resolve all banks in the SSM. In order for the Single Resolution Mechanism to be perceived as credible, it should have sufficient funding. Let me be very clear I am not talking about bailing-out banks with public money. Resolution is about orderly resolving the situation of banks that have attained the point of non-viability and about doing it in a way that minimizes the involvement of public money. Resolution is not about bailing-out banks it is about bailing-in shareholders and creditors and using a Resolution Fund based on banking sector contributions. Resolution activity may require the temporary use of public money if the Resolution Fund would not have enough resources, for instance, to capitalize a bridge bank that will be sold later on to the private sector thus recovering the capital involved”. As usually when it comes to generously support the banks, politicians and central bankers want us to believe that it is for our own good, us citizens, to create cushions for failing banks. He didn’t say a word about restoring the good old rules for banks, which were adamant over how depositors’ money could be used by lenders. Before the full liberalisation of our Western banking system, banks were not allowed to use other people’s money to bet on all and every market, from oil, wheat and corn to Greek bonds. The great American credit crunch and the subsequent European sovereign debt crisis proved that banks were free to bet depositors money to whatever risky placement offered short term profits. Not caring about certain medium term crisis prospects. First year students of economics will tell you that risky financial bets may purport short term profits but they are surely leading to crisis. For God sakes how much more taxpayers’ money and newly printed ECB banknotes the banks want? Incidentally it must be noted that the ECB has supplied the Eurozone banks with billions in liquidity facilities, in order the lenders to start lending money to the real economy for more jobs to be created. This was the theory ECB used to justify the almost zero cost loans to banks. Instead the banks jealously kept this free liquidity for “their own use” and actually reduced the credit to the real economy, businesses and households alike.